in Social Media with tags Canada, Facebook, Facebook messenger, global insights, google+, North America, social media, Twitter, YouTube Both comments and trackbacks are closed. As brands expand their global reach, marketers face an increasingly complex ecosystem of digital platforms, people, and preferences. Globally-focused marketers must move beyond “one size fits all” messaging across countries, and toward a better understanding of regional differences in media consumption and behaviors. Our Global Social Insights blog series aims to help marketers better understand trends in digital and platform adoption across the globe. This is the third post of our series, and covers North America. To read more about the series and for an analysis of Europe’s top social platforms, read Post I here. 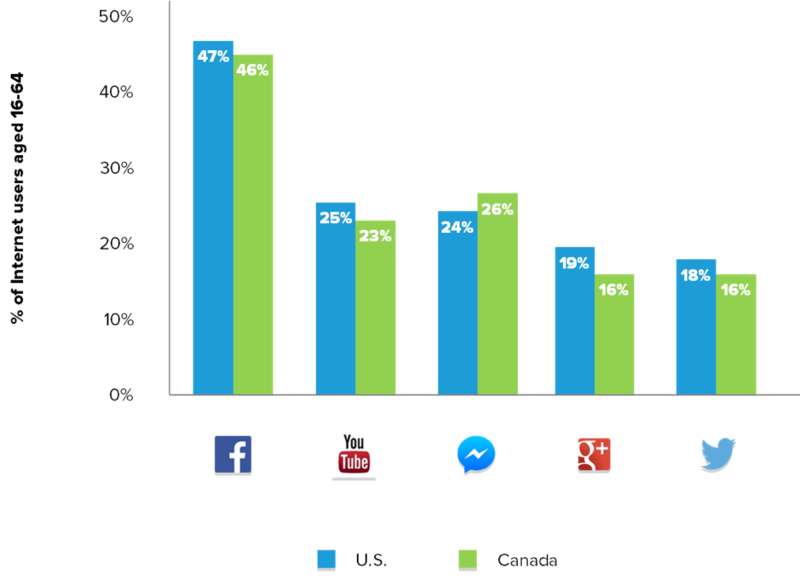 To learn more about the top social platforms in Asia Pacific, read Post II here. North America includes the U.S. and Canada for the purpose of this blog post. Mexico will be included in the Latin America blog post. The top five most popular social media platforms in the U.S. and Canada include Facebook, YouTube, Facebook Messenger, Twitter and Google+. Social media usage has steadily increased over the last three years for both countries, reaching a penetration of 56.1% in the U.S. and 55.6% in Canada in 2015. Among platform usage, Facebook still reigns supreme in North America, despite a 6% drop in the size of its user base in the U.S. from 2014 to 2015. Facebook Messenger attracted a healthy consumer base in the U.S. and Canada with 24% and 26% of the populations respectively using the app in 2015, trumping both Google+ and Twitter in popularity. In both the U.S. and Canada, Facebook and Facebook Messenger attract more female users, while other platforms in these countries experience a more even split in gender. Facebook Messenger is the only chat-based app/platform to make the top five most-used social media platforms in either county, a finding that sets North America apart from other regions where apps like WhatsApp and Skype are commonly among the most popular platforms being used in those regions. Slower adoption of chat-based apps in North America can be attributed to the popularity of messaging capabilities within existing, widely-used platforms such as Facebook as well as the more basic functionalities of messaging apps available in the U.S. vs. advanced gaming and payment functionalities that are common in messaging apps from other regions. In North America, Twitter usage skews towards those aged 16 to 24 in Canada, making up 31% of the platform’s user base in that country. Meanwhile in the U.S., the platform attracts more 25 to 34 year-olds, a segment that makes up 31% of users. However, of the general population, only 16% of U.S. consumers and 14% of Canadian consumers use the Twitter application on mobile. Internet usage in 2015 in the U.S. and Canada remains high with saturation at 83.7% and 84.9% respectively, among adults aged 16 to 64. Looking at overall mobile usage, the U.S. and Canada have plateaued in growth, with the U.S. only growing from 79.3% in 2014 to 80.3% in 2015, and with Canada remaining flat at 79.6% year-over-year. Smartphone saturation has seen marginal growth in the U.S. from 57% in 2014 to 59.3% in 2015, making it one of the few countries across the globe that did not see a decrease in smartphone usage from 2014 to 2015. Saturation reached a plateau in Canada at 56.9% in 2014, and decreased to 56.6% in 2015. Internet usage in the US and Canada remains high at 83.7% and 84.9% respectively, while smartphone saturation has seen marginal growth in the US, reaching 80.3% penetration from 79.3%. Canada’s smartphone penetration has stayed stagnant at 79.6%. Social media use in North America is beginning to mature as yearly growth for individual platforms slows. As such, the region’s most dramatic marketing opportunities are likely to come in the form of new platforms like messenger apps which will reward brands who act early to reach the young digitally-native audiences who are quick to adopt new trends. Marketers should be on the lookout for these emerging platforms. Facebook leads the top platforms in North America by penetration with over 45% of Internet users on the platform. While new platforms present unique opportunities to connect with younger audiences, marketers should not forget about Facebook as a key platform.